Spoof news: What If Bush Had Tied Social Security To The Stock Market? What If Bush Had Tied Social Security To The Stock Market? Mr. Dotemer Of Blosterville, Texas Feels A Lot Better Now That He's Had His Cat For Dinner. Let's take a short trip into fantasy land for a moment- let's imagine what the world would be like if George W. Bush and his cronies had actually put the Social Security funds of this nation into the stock market like they wanted to. What would our headlines be like today with the near-depression levels of our economy? 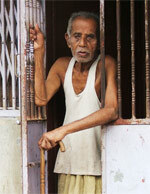 Where would our elderly citizens who depend on it for their survival be today? When told of these developments at his new $2 million mansion in Dallas, ex-President Bush said "Gosh, I'm sorry about that. But its not my watch now." and went back to reading his paper. When pressed for a comment ex-vice President Cheney said "Let' em eat cake!" and slammed down the phone.